First part of our Interview with Joseph Goodman and Harley Stroh. Second part and German version will follow shortly. Argamae: Was there a specific reason for making the Dungeon Crawl Classics line? You count among the forerunners of the OSR (old school renaissance) or would you disagree? 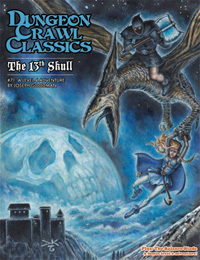 Joseph: When I published Dungeon Crawl Classics #1: Idylls of the Rat King in 2003, it was one of the only products available – whether commercial or amateur – that could be described as “old school.” As sales took off for the DCC line, it became clear to me that there was a market for a subject I am interested in, which was a specific sort of nostalgic dungeon crawl experience. Five years later, Grognardia first came online, and the OSR began to build solid momentum just as 4E was also being launched. I’m sure I wasn’t the only renaissance gamer excited to find like-minded compatriots in the OSR blogosphere. As I transitioned Goodman Games to publish more 4E modules, I found myself continually interested by projects related to a simpler, faster game experience than what 4E offers. I was also diving deep into Appendix N, and had decided to read every book in the bibliography. Alongside all of these events was my continuing interest in the aesthetics of early D&D and the books of Appendix N – not just the great artists of TSR, who we’re all familiar with, but the generations before them, such as the covers for Weird Tales, the art of Frank R. Paul and Virgil Finlay, and the look of the 1970’s magazines and comics that many of us associate (consciously or not) with our earliest D&D experiences. 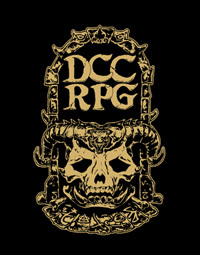 DCC RPG is a confluence of all these events: the success of the DCC line, the burgeoning market for retro-style products, the gathering momentum of the OSR, my personal interest in a simpler form of D&D, my desire to create a gaming experience that expresses the spirit of adventure that I find in Appendix N, and my interest in a visual experience that conjures up the purest form of D&D reminiscences. In many ways, DCC RPG is the culmination of a journey that began for me nine years ago with the publication of DCC #1. I really feel like everything I have gone through over the last nine years has led me here, at least from a gaming perspective. DCC RPG is the game I’ve always wanted to play – and, in many ways, is the game I always have played, just under different names. Argamae: What is your favourite DCC module? Harley: With over fifty adventures, it is hard to choose a favorite. However, DCC 17, Legacy of the Savage Kings remains very close to my heart. It was the first DCC I wrote for Goodman Games, and in many ways it remains the best. Argamae: Did you ever encounter unexpected problems when bringing the DCCs from 3e to 4E? Such as? Harley: The biggest surprise was the success and utility of the character builder and the digital tools. The inability of third party publishers to contribute to the digital content of 4e proved to be a great challenge. Products that were hugely successful in 3e and 3.5 were suddenly obsolete under 4e. While WotC’s digital initiative has encountered a number of hurdles in its roll out, it also proved to be a game changer for third party publishers. Joseph: Yes, quite a few. As I’m sure many fans recall, Wizards of the Coast offered a 4E license, known as the GSL, and there were many twists and turns in that process. I gained a lot of publisher XP during that time. Argamae: What formats for the DCC line do you plan for the future? For example, will there be more 2$ modules or another DCC with a soundtrack CD? Joseph: Lately I find myself gravitating toward short adventures that can be read by the GM in a couple hours, and then provide a couple sessions‘ worth of play experience. Call it my personal preference if you’d like, or perhaps the hallmark of being an older gamer with family, but that’s the style of game I personally find easiest to run, and I think it’s a style of publishing that offers the lowest barriers to entry. Based on that, I’m steering the DCC line toward shorter adventure modules – in the 16 to 24 page range. Ironically, because DCC RPG uses such a concise stats format, a 16 page module under DCC RPG rules gives about as much play time as a much longer module under other editions of the rules. The Free RPG Day adventures will continue to grow more interesting, as this year’s Free RPG Day adventure will launch an adventure design contest that will reward readers both financially and creatively – and give a lucky fan the chance to put his adventure in front of several thousand gamers as the next year’s Free RPG Day module. Argamae: What is your target audience for the upcoming DCC roleplaying game? Joseph: Joseph Goodman is my target audience. I have said this before and I’ll say this again: I’m writing this game for me. It’s the game I’ve always wanted to play. Hopefully a few other folks will like it as well. Argamae: What’s your recipe for an original and entertaining dungeon design? How do you get about? Harley: Ideally, I want the players (and their characters) to overcome impossible odds, and to have an epic adventure that they will remember for years to come. To often, as DM and judges, we dial back our expectations, running trivial adventures early on and saving the epic adventures for the end of a campaign. But Beowulf didn’t have any „trivial“ adventures. Whether level 1 or level 20, every adventure should be breath taking and memorable. Joseph: Every writer has a different process, so I can only describe what works for me. And I must be clear that the process for publishing an entertaining module is very different from the process of writing one. Now, that said, my own writing process is a mix of strong visuals, lots of inspiration, and percolation time. I read extensively, including fiction (lots of Appendix N lately), comics, and art books. Typically I am „hit“ with cool ideas for scenes or encounters, and I jot them in a notebook that has lots of random scribbles in it. Over time some of the scenes seem to connect to each other, and then I come up with a plot that connects them. Once I have an idea for the basic plot, I usually spend a long time getting the title right. Then and only then do I sit down to write it. After that comes the most important part: play testing. Many well-written modules don’t play that well, and vice versa; play testing is a requirement to really learn if a module gives not just a good reading experience but also a good playing experience. It’s easy for writers to forget that the players never see anything in the module – all the players know about the writer’s words are how the GM paraphrases them. You as the adventure writer have to give the GM strong, simple visual descriptions that can bring your scenes to life in his descriptions to the players. Playtesting is key to understanding if these scenes come across right, and to gauge the flow of the adventure’s encounters. I guess that’s a long-winded explanation but hopefully it makes sense. Argamae: Are there any inquiries for foreign language editions of the DCC RPG yet? Is it reasonable to expect another German edition? Joseph: There have been some inquiries. I would say that something’s definitely possible. If there are parties out there interested in a foreign language edition – either as a fan or as a publisher – they should get in contact with me. Argamae: Did you ever receive direct feedback from a German DCC? Argamae: Did you approach Monte Cook for DCC #50 or did he approach you? Harley: Joseph lined this one up. He can tell the tale. Although, I’m proud to share that Monte played in our DCC tournament the very next GenCon! Joseph: Hmm, I’m trying to recollect. I think I approached him. But as I recall he was already a fan of the series and was interested in working on it. DCC #50 is still one of my favorite modules — the rotating map is awesome. Argamae: Are there any plans to re-issue older DCCs (from 3e/4e) for the new DCC RPG? Joseph: I have no plans to re-issue older DCC modules for DCC RPG. 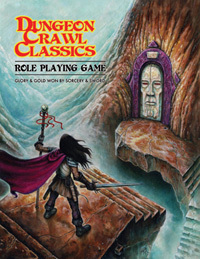 DCC RPG has many core concepts related to maintaining a distinctive spirit of adventure in the game, and earlier DCC modules did not follow those rules. One of my biggest goals with the game is to give players the same experience they had when they were young and discovering D&D for the first time. One of the best ways to do this is to create a sense of mystery and surprise – to leave the players constantly unsure of their opponents. Remember when a beholder was a mysterious opponent that you had no idea how to beat? DCC RPG has an extremely simple stat system for monsters, and encourages new monsters in every encounter. It also relies heavily on an Appendix N style of adventure, which is present in some 3E/4E modules but not all. I think that gamers who enjoyed our DCC modules in prior editions will enjoy the DCC RPG modules even more. There are very few publishers who can say they’ve published nearly 100 adventure modules and learned the lessons from that. I have the luxury to make such a claim, and I believe the new line of DCC RPG adventures will represent a style of adventure – and an ease of use and a beauty of presentation – that really is the best I’ve published in more than ten years of publishing. Argamae: With the 2$ modules, the compilation „The Adventure Begins“ and the 0-level-DCCs did you intend to reach newcomers to the hobby? Harley: The hope is always to lower the hurdle for new gamers. Gamers that might not otherwise buy a DCC might find it hard to turn away a $2 DCC. And if it happens to bring in new gamers, all the better! Joseph: Yes. All of those efforts helped tremendously, as did Free RPG Day, which was my idea; I co-created Free RPG Day with Aldo Ghiozzi of Impressions Marketing, which runs the event now. There’s a time and place for every opportunity, and those were all good initiatives at the right time and place to help expand the reach of the DCC line to both newcomers and established gamers. Argamae: Could you explain briefly the process of making a DCC module (from the initial concept to the final version)? Can you remember a specific DCC module where this was especially tricky? Harley: Any adventure begins with a pitch: a short synopsis that highlights the strengths of an adventure. Once an adventure receives the green light, the author designs the adventure and sketches any of the maps. Once the first draft is complete, we send it off to be playtested, either by the author, or – ideally – by strangers. The feedback from the playtests inform any revisions and corrections. Once the final draft is submitted the adventure is edited, and then sent off to layout and cartography. At the same time, we are commissioning artwork. Once the art and final maps are complete, the entire package is reviewed by proofreaders and editors for accuracy, before being sent off to print. Harley: All in all, it is a very involved process, where any one step can hold up the entire release. The trickiest DCC, in terms of process, had to be our epic megadungeon, Whiterock Castle. While the adventure was in development for years, it fell to Joseph to kickstart the adventure into reality. A group of authors and editors met in Las Vegas, we were lined out the plan for Whiterock over the course of the weekend. Each member of the team was given specific deadlines, tasks and assignments, and each person was essential to ensuring that the box set be completed on time. By the end of the weekend we were all joking that if any single person got hurt or sick, we would miss our due date. It was a joke, but the joke was founded in reality: if any one person missed their goals, Whiterock would have missed its deadline and not made it to GenCon. Argamae: How are the playtests conducted? Do you have fixed test groups or could anyone approach you for becoming a playtester? Harley: While we do have playtest groups that we rely upon, the best playtesters are always strangers. We always welcome new playtesters, although it can be hard for groups to make time to try out DCCs when they are also running home campaigns. This is why so many of our DCCs are playtested at conventions. Joseph: Anyone can approach me. For DCC RPG, I ran many games myself to make sure everything went smoothly. I wrote 3 of the first 8 DCC RPG modules, and I’ve played each of them at least a half-dozen times, if not more. Running the same adventure so many times is interesting…eventually I get bored and start changing stuff on the fly. But sometimes the players make interesting in-game decisions and it suddenly seems fresh again. Anyway, back on topic, other parties also ran play tests of the first-generation DCC RPG modules, including some of the outside play testing groups that helped me make sure everything was balanced. And of course all modules written by an outside author have to be play tested by that author and his own group. Argamae: Did you read all of the DCCs yourself? Harley: I pride myself in reading every DCC that comes out. Joseph: Yes. There have been times when I’ve had dedicated line editors who do more of the, shall we say, „narrowing of the candidates“ for me. Over the years I’ve gone back and forth between how much I’ve relied on line editors versus my own engagement. For DCC RPG to be „right“ I knew I had to be personally engaged very heavily, so I have been personally involved in all aspects of the DCC RPG modules.